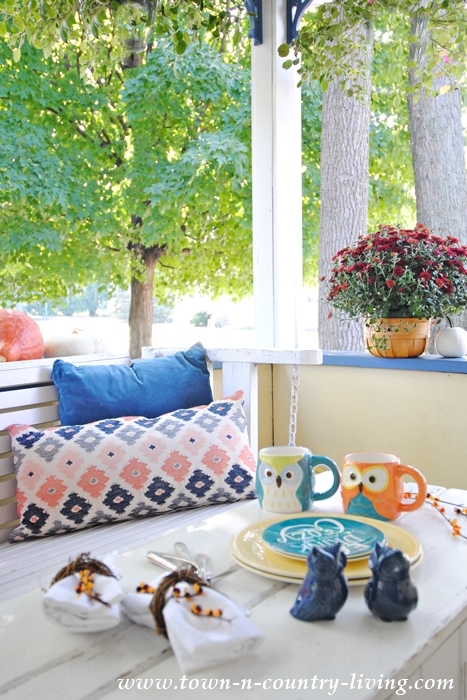 Summer’s flowers are fading and that means it’s time to add color to the front porch with fun pumpkins and pillows. Our days here in Illinois are still warm but the evenings are cooler and enjoyable. Hubby and I want to take advantage of the mild weather and enjoy dining al fresco when we can. My fall front porch is arranged to maximize enjoyment outdoors before the temperature gets too nippy. 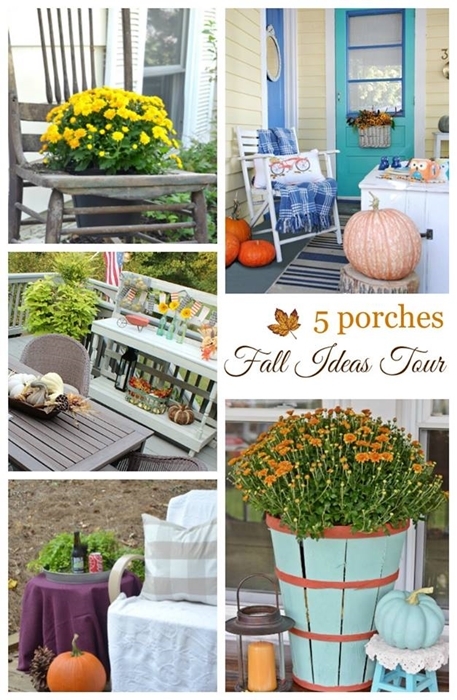 I’m joining a group of bloggers today to share our porches … and you can visit all the Fall Ideas Tour participants from earlier this week. All the links are at the end of the post. 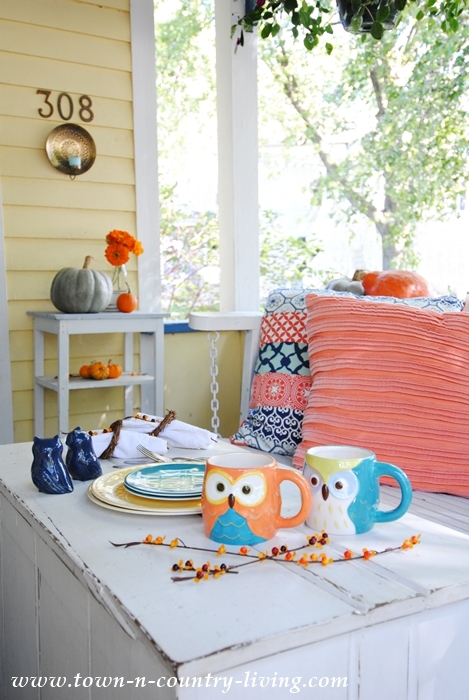 A pair of adorable owl mugs became the inspiration when decorating my porch for fall. These are now my go-to mugs for morning coffee. They put on a smile on my face, which is good for starting the day. I loved the bright color of the mugs when I saw them on the shelf at Target, and remembered I had pillows that matched the colors. 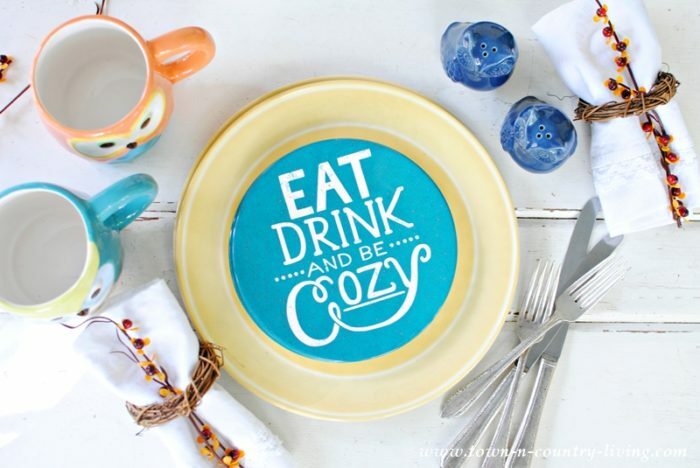 Eat Drink and Be Cozy melamine plates are perfect for outdoor dining. If you drop them, they won’t break. Comfy pillows create a soft backdrop when dining outdoors. This is a perfect spot for a cozy tete-a-tete for two. 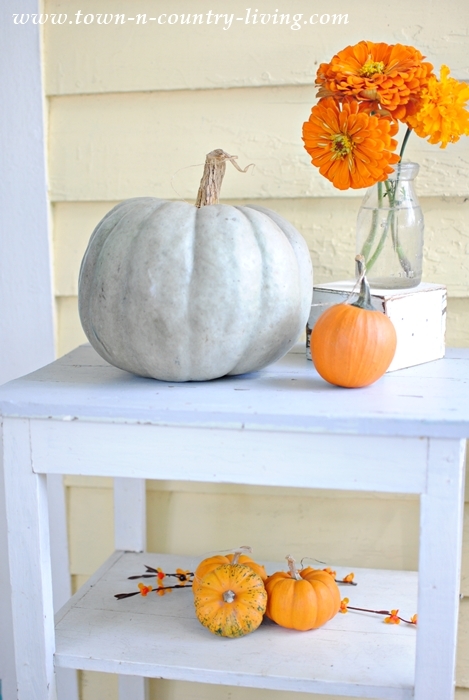 My fall front porch enjoys a collection of orange, white, and gray pumpkins. We have lots of local farmers who sell pumpkins for dirt cheap, which is lucky for me. 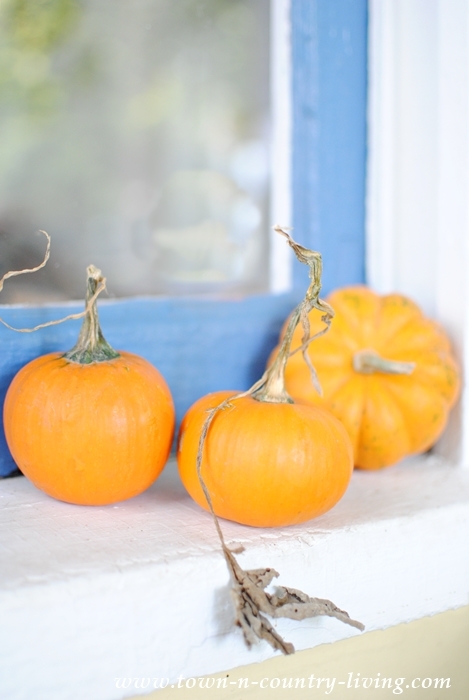 I like the pumpkins that still have leaves clinging to them. My zinnias are still in bloom and fortunately I had a few orange blossoms out in the garden. 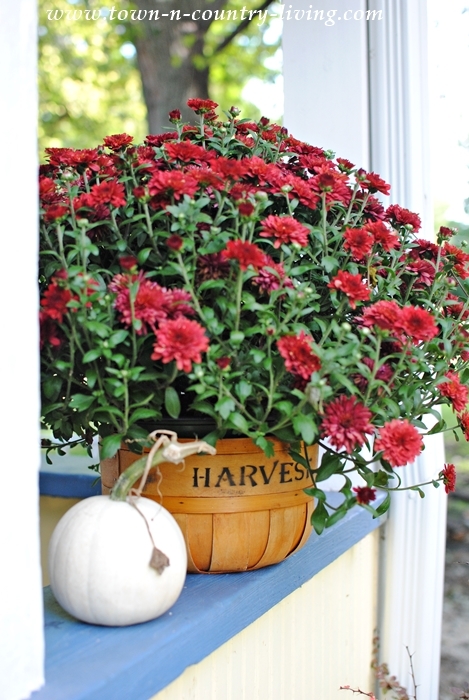 You can’t have a fall front porch without at least one flowering mum. 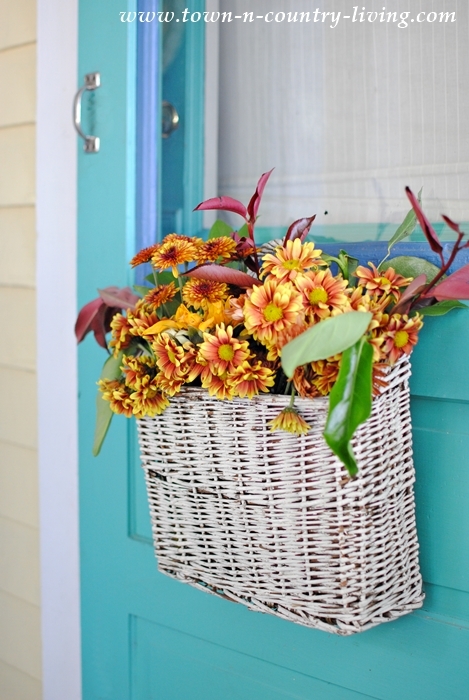 And a basket of fall flowers adorns the front door, in lieu of a fall wreath. Now it’s time to whip up a casual dinner to enjoy al fresco on the porch. 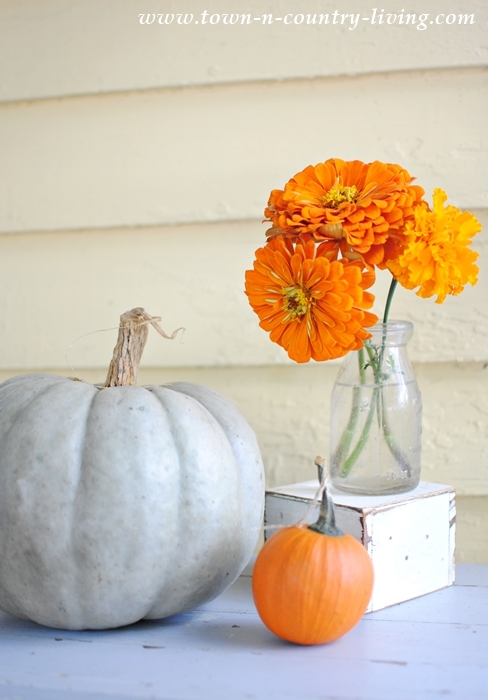 Be sure to visit some of my blogging friends below for more fall decorating inspiration! Today is all about porches, but you’ll see from the links below that other decorating themes occurred throughout the week. Enjoy! because the dang lovebugs are so bad. On the porch, inside the storm door, inside the house, ugh. Wow Jennifer…your porch is gorgeous! 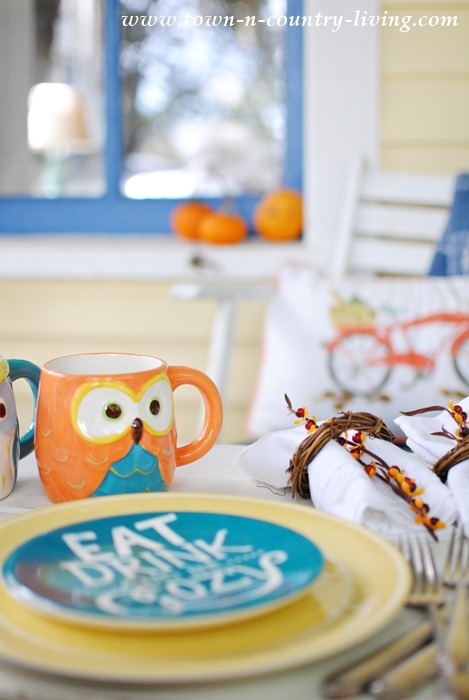 We love your use of color – the owls and plates are adorable favorites! We especially like the basket wreath on your beautiful front door! Everything looks so inviting. Happy Fall! I will be right over to dine with you! I love this! Thanks for sharing it with us! Your porch is gorgeous! I just want to sit down and have a drink of cocoa out of my owl mug! Wow, your porch is beautiful. All the pops of color are great. I love the basket hung low on your front door. I think I’ll go pumpkin shopping today. You’ve inspired me and yes, my husband and I eat on our porch most nights. In the Midwest the winters can get crazy so we like to spend as much time outside as we can. 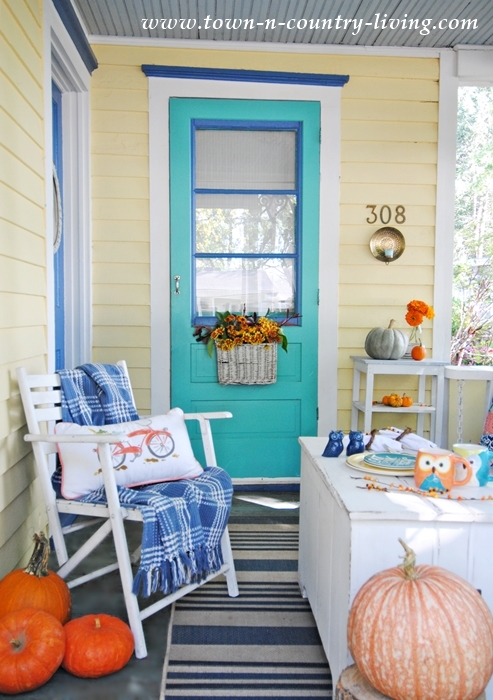 Enjoy your beautiful fall porch. I’m in love with the blue and white plaid blanket on the chair. Your color palette is so appealing to me! I just want to paint everything I own in these colors. But my house is brick. So pretty and inviting! I want to come over this evening – wish I lived closer!!! You have such a pretty space to enjoy! I love all of your pretty pumpkins and the flowers that you used from your yard. 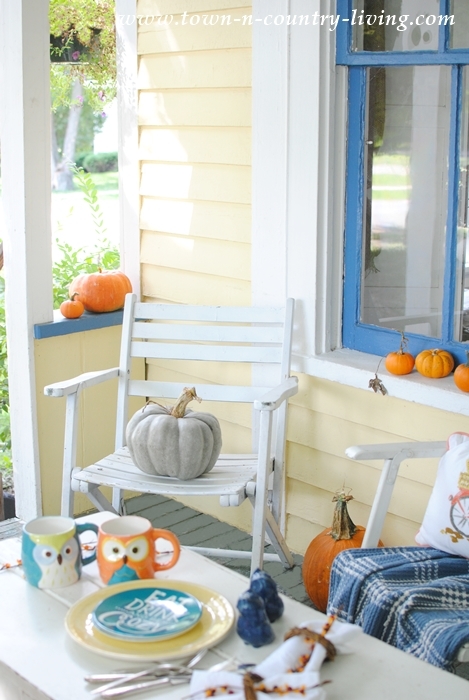 I think I’d want to spend every possible moment on your pretty porch before it gets too cold to enjoy it. Jennifer, I would feel right at home on your porch because we are liking the same colors this year! I love every detail and those owl mugs are just the cutest things! Happy to be on the tour with you! Your porch is super pretty, I love the colors you used! 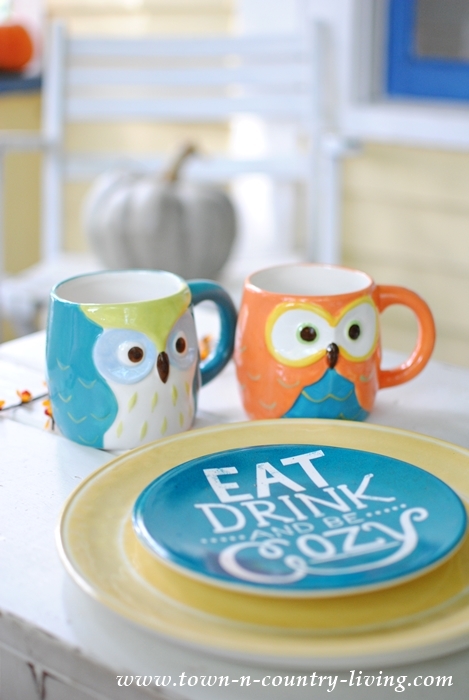 And those Owl Mugs are adorable!! Your porch is so vibrant and welcoming. 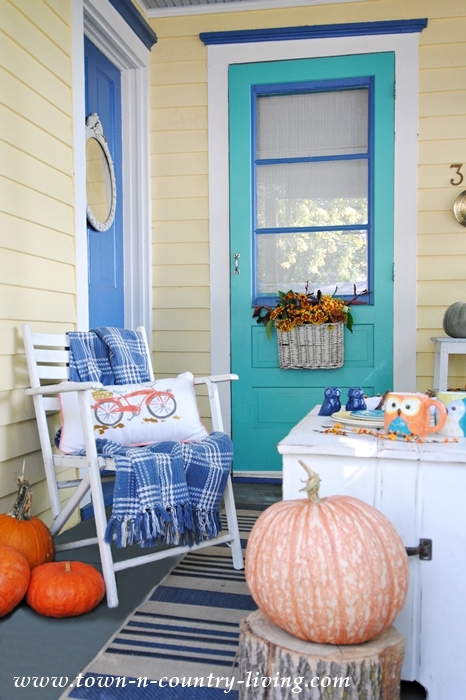 The pumpkins and mums are the perfect accent to your house colors. And I love those owl mugs! Thanks so much for joining us on the tour! Playing major catch up and your porch is gorgeous. I love the pillow with the bicycle and the basket on the front door. So welcoming! What a great place to enjoy a meal!